Women’s Sport Week runs from 3 – 9 October 2016. Women’s Sport Week is an opportunity for everybody involved with playing, delivering, leading or working in sport to celebrate, raise awareness and increase the profile of women’s sport throughout the UK. The objective of Women’s Sport Week is to celebrate and showcase women’s sport at every level, from the grassroots to the elite, and highlight the incredible contribution that women make to sport. And of course the overall aim is to get more women and girls physically active and playing sport. Women in Sport will be launching Women’s Sport Wednesday, a fundraising campaign to help transform sport for the benefit of every woman and girl in the UK. The first Women’s Sport Wednesday will take place on 5 October 2016, during national Women’s Sport Week, and will launch an campaign through which Women in Sport aims to make Wednesdays the day of the week when every playing field, pitch, pool, track and court is filled with women and girls playing sport and having fun, all in the name of charity. Participants are encouraged to organise their own Women’s Sport Wednesdays fundraising activities to celebrate and encourage women’s and girl’s sport. From table tennis tournaments in the office to fancy dress matches on the pitch, Women’s Sport Wednesdays aim to offer something for everyone to take part in. And Sport England will be using the week to continue to drive home the benefits of the hugely successful This Girl Can campaign. One of the overall aims of Women’s Sport Week is to get more coverage of women’s sports across different media. During the week, Sky Sports and the BBC will devote more broadcast time to celebrations of women’s sport, in a bid to improve sustained and consistent media profiling of female athletes and sports teams. Click here to keep a track with what is and has been going on in the press, on TV and online during Women’s Sport Week 2016. 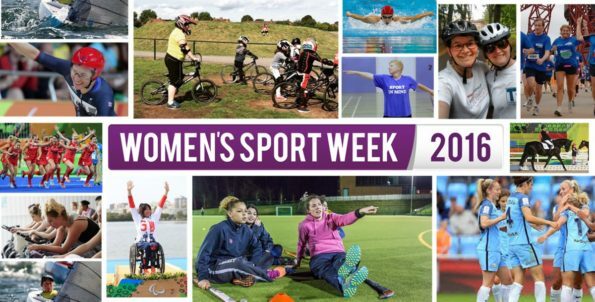 Get involved in Women’s Sport Week and tell everyone what you are getting up to using the hashtag #WSW16. Click here to find out what’s on near you. And don’t forget to share your stories with Women in Sport.